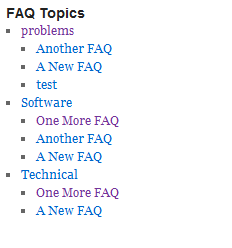 This plugin provides a very powerful widget that can be used to display a list of terms from any taxonomy, and also a list of recent posts for each term in the taxonomy. The widget is extremely well suited for directory websites that need to list “sections” and entries within those sections. 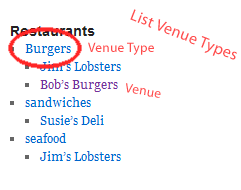 For example, you could use this widget to list the different types of restaurants in your directory, and also the individual restaurants in each type. Please watch the demonstration video for a more thorough explanation and demo of this type of usage. 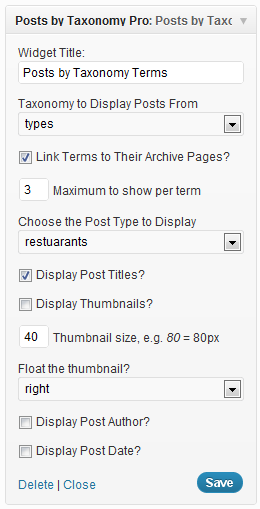 This widget is exceptionally well suited to be paired with Easy Custom Content Types. Use it to display the directory you have been able to create with ECPT.